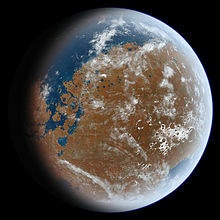 An artist's idea of what ancient Mars may have looked like, based on geological data. There is less water on Mars compared to Earth. Most of the water known is in the cryosphere (permafrost and polar caps). There is no liquid water. There is only a small amount of water vapor in the thin atmosphere. The conditions on the planet's surface do not support the long-term existence of liquid water. The average atmospheric pressure and temperature are far too low, which freezes water. However, it seems Mars once had liquid water flowing on the surface. This would make large areas like Earth's oceans. There are a number of signs of water on or under the surface, now or in the distant past. These include stream beds, polar caps, spectroscopic measurement, eroded craters. Also, there are minerals which are often formed when there is liquid water (such as goethite), grey, crystalline hematite, phyllosilicates, opal, and sulfate. The Mars flybys such as Viking, Mars Odyssey, Mars Global Surveyor, Mars Express, and the Mars Reconnaissance Orbiter had cameras. They took pictures of what seem to be ancient lakes, ancient river valleys, and widespread glaciation. An orbiting Gamma Ray Spectrometer found ice just under the surface of much of the planet. Also, radar studies found ice that were thought to be glaciers. The Phoenix lander showed ice on Mars when it was landing. Phoenix also showed ice melting, snow falling, and even saw drops of liquid water. A recent report says Martian dark streaks on the surface were affected by water. Many Mars flybys and probes have found evidence of water on planet Mars. Mariner 9 found water erosion and deposition, weather fronts and fogs. 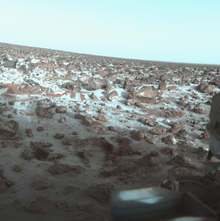 Viking 2 landed on Mars in its winter season and found frost. The Mars Global Surveyor, which could detect ancient water, found that Mars has been dry for a very long time. On December 6, 2006 NASA released photos of two craters called Terra Sirenum and Centauri Montes that showed liquid water at one point in 1999 and 2001. Pathfinder found that water existed before on Mars. Pathfinder confirmed that where it landed it is too cold for liquid water to be. However, water could be in its liquid state if it were mixed with various salts. Pathfinder also found evidence of clouds and maybe fog present in Mars. Mars Odyssey found much more evidence for water on Mars. The pictures taken by Odyssey confirmed that the ground is filled with ice. In July 2003, at a conference in California, it was said that the Gamma Ray Spectrometer (GRS) onboard the Mars Odyssey had found large amounts of water over large areas of Mars. Mars has enough ice just below the surface to fill Lake Michigan twice. On August 4, 2011, NASA said they found seasonal changes. These changes were found in gullies near crater rims on the Southern hemisphere. This shows that there is salty water flowing and then evaporating. This leaves some sort of residue. The Mars Ocean Hypothesis is a hypothesis that nearly a third of the surface of Mars was once covered by an ocean earlier in its history. The ocean, which is called Oceanus Borealis, would have filled the Vastitas Borealis basin in the northern hemisphere. The Vastitas Borealis is 4–5 km (2.5–3 miles) miles below the planetary elevation. Oceanus Borealis dried up 3.8 billion years ago. Early Mars would need a warmer climate and thicker atmosphere to let liquid water stay at the surface. ↑ "Mars Global Surveyor measures water clouds". Retrieved March 7, 2009. ↑ "Flashback: water on Mars announced 10 Years Ago". SPACE.com. June 22, 2000. Retrieved December 19, 2010. ↑ "Science@NASA, The Case of the Missing Mars Water". Retrieved March 7, 2009. ↑ "PSRD: Ancient Floodwaters and Seas on Mars". Psrd.hawaii.edu. July 16, 2003. Retrieved December 19, 2010. ↑ "Gamma-Ray Evidence Suggests Ancient Mars Had Oceans | SpaceRef – Your Space Reference". SpaceRef. November 17, 2008. Retrieved December 19, 2010. ↑ Carr M., Head J. (2003). "Oceans on Mars: An assessment of the observational evidence and possible fate". Journal of Geophysical Research 108: 5042. doi:10.1029/2002JE001963. ↑ "Water at Martian south pole". March 17, 2004. Retrieved September 29, 2009. ↑ "ch4". History.nasa.gov. Retrieved December 19, 2010. ↑ Harrison K, Grimm R. (2005). "Groundwater-controlled valley networks and the decline of surface runoff on early Mars". Journal of Geophysical Research 110. doi:10.1029/2005JE002455. ↑ Howard, A.; Moore, Jeffrey M.; Irwin, Rossman P. (2005). "An intense terminal epoch of widespread fluvial activity on early Mars: 1. Valley network incision and associated deposits". Journal of Geophysical Research 110. doi:10.1029/2005JE002459. ↑ "Articles | Was there life on Mars? – ITV News". Itv.com. Retrieved December 19, 2010. ↑ Fassett C., Head III (2008). "Valley network-fed, open-basin lakes on Mars: Distribution and implications for Noachian surface and subsurface hydrology". Icarus 198: 37–56. doi:10.1016/j.icarus.2008.06.016. ↑ Parker, T.; Clifford, S. M.; Banerdt, W. B. (2000). "Argyre Planitia and the Mars Global Hydrologic Cycle" (PDF). Lunar and Planetary Science XXXI: 2033. http://www.lpi.usra.edu/meetings/lpsc2000/pdf/2033.pdf. ↑ Heisinger H., Head J. (2002). "Topography and morphology of the Argyre basin, Mars: implications for its geologic and hydrologic history". Planet. Space Sci. 50 (10–11): 939–981. doi:10.1016/S0032-0633(02)00054-5. ↑ Moore J., Wilhelms D. (2001). "Hellas as a possible site of ancient ice-covered lakes on Mars". Icarus 154 (2): 258–276. doi:10.1006/icar.2001.6736. ↑ Weitz, C.; Parker, T. (2000). "New evidence that the Valles Marineris interior deposits formed in standing bodies of water" (PDF). Lunar and Planetary Science XXXI: 1693. http://www.lpi.usra.edu/meetings/lpsc2000/pdf/1693.pdf. ↑ "Liquid Saltwater Is Likely Present On Mars, New Analysis Shows". Sciencedaily.com. 2009-03-20. Retrieved 2011-08-20. ↑ Rennó, Nilton O.; Bos, Brent J.; Catling, David; Clark, Benton C.; Drube, Line; Fisher, David; Goetz, Walter; Hviid, Stubbe F. et al. (2009). "Possible physical and thermodynamical evidence for liquid water at the Phoenix landing site". Journal of Geophysical Research 114. doi:10.1029/2009JE003362. ↑ "Mars Exploration: Missions". Marsprogram.jpl.nasa.gov. Retrieved December 19, 2010. ↑ Baird, A.; Toulmin P, 3rd; Clark, BC; Rose Jr, HJ; Keil, K; Christian, RP; Gooding, JL (1976). "Mineralogic and Petrologic Implications of Viking Geochemical Results From Mars: Interim Report". Science 194 (4271): 1288–1293. doi:10.1126/science.194.4271.1288. PMID 17797085. ↑ Hoefen, T.; Clark, RN; Bandfield, JL; Smith, MD; Pearl, JC; Christensen, PR (2003). "Discovery of Olivine in the Nili Fossae Region of Mars". Science 302 (5645): 627–630. doi:10.1126/science.1089647. PMID 14576430. ↑ Henderson, Mark (December 7, 2006). "Water has been flowing on Mars within past five years, Nasa says". The Times. UK. Retrieved March 17, 2007. ↑ Fairen, A.; Davila, AF; Gago-Duport, L; Amils, R; McKay, CP (2009). "Stability against freezing of aqueous solutions on early Mars". Nature 459 (7245): 401–404. doi:10.1038/nature07978. PMID 19458717. ↑ Golombek, M.; Cook, RA; Economou, T; Folkner, WM; Haldemann, AF; Kallemeyn, PH; Knudsen, JM; Manning, RM et al. (1997). "Overview of the Mars Pathfinder Mission and Assessment of Landing Site Predictions". Science 278 (5344): 1743–1748. doi:10.1126/science.278.5344.1743. PMID 9388167. ↑ "Mars Odyssey: Newsroom". Mars.jpl.nasa.gov. May 28, 2002. Retrieved December 19, 2010. ↑ Clifford S. M., Parker T. J. (2001). "The Evolution of the Martian Hydrosphere: Implications for the Fate of a Primordial Ocean and the Current State of the Northern Plains". Icarus 154: 40–79. doi:10.1006/icar.2001.6671. http://www.sciencedirect.com/science?_ob=ArticleURL&_udi=B6WGF-457CXN8-4&_user=126524&_rdoc=1&_fmt=&_orig=search&_sort=d&view=c&_acct=C000010360&_version=1&_urlVersion=0&_userid=126524&md5=f78bbc3ae211391e23070bd03d8e1dc6. ↑ Baker V. R., Strom R. G., Gulick V. C., Kargel J. S., Komatsu G., Kale V. S. (1991). "Ancient oceans, ice sheets and the hydrological cycle on Mars". Nature 352 (6336): 589–594. doi:10.1038/352589a0. ↑ Read, Peter L.; Lewis, S. R. (2004). The Martian Climate Revisited: Atmosphere and Environment of a Desert Planet (Paperback). Chichester, UK: Praxis. ISBN 978-3-540-40743-0. Retrieved December 19, 2010. Wikimedia Commons has media related to Water on Mars.